Every year the Tokyo Quilt Festival is eagerly awaited by quilters around the world so we can drool over the absolutely beautiful quilts presented…..definitely an inspiration to enhance our skills and open our minds to new techniques…..Pictures of 2017 Tokyo Quilt Festival have been posted by okanarts.com. Grab that cup of coffee, put your feet up and enjoy the wonderful eye candy. Pick a favourite and pick one that you would like to make….the one pictured is the one I’m going to try…. Missouri Star Quilts has a new tutorial for this updated version of a traditional Drunkard’s Path block. The video can be here. Such a simple update with a maximum WOW affect. Now the block is a very modern 2 colour quilt. Scrappy would probably look good as well….Bright fabrics in a rainbow of diagonal lines for that WOW factor…….. or muted pastels for the soft cozy calming feel to cuddle under with a good book and a cup of tea..
I’m also wondering if the Quick Curve Ruler by Sew Kind of Wonderful couldn’t be used in making the Drunkard’s path block. Want to Join a Modern Quilt Along ? Quilt Alongs are a great way to learn new techniques and explore new ideas. Keeping your mind open to “new to you” ideas will definitely enhance your quilting experience. For me, playing with new ideas is what quilting is all about….remember I’m the perfectly imperfect quilter. Modern Quilt Along 2017 introduced by Simple Simon and Company will start in February. What exactly is a modern quilt. Check out this definition from the Modern Quilt Guild. Osprey’s Nest is an unusal paper pieced quilt by Judy Niemeyer (Quiltworx.com). The arcs of flying geese are all paper pieced for accuracy and then inserted into a log cabin block. Lots of different techniques to satisfy any quilter. Pinterest images definitely show how choice of fabric changes a quilt pattern. I’ve always found that amazing. Love the Art Deco look of this quilt. 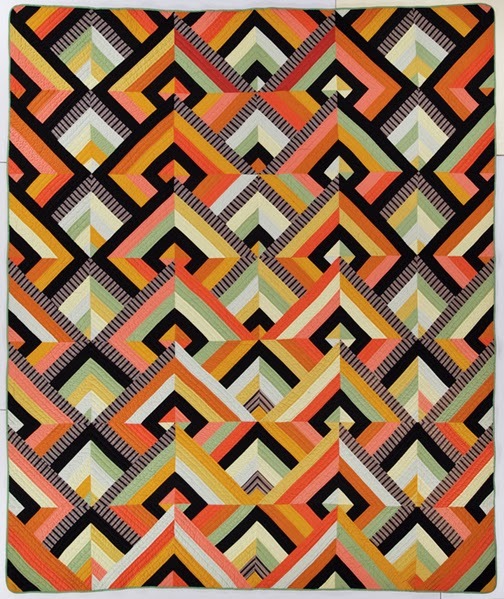 Geometric quilts have always intrigued me. This will definitely go on my “to do” list. 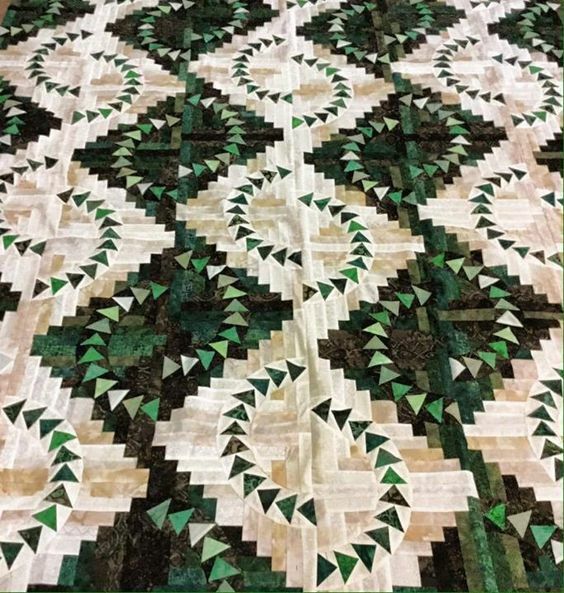 The sage green seems to soften everything.. Looks like a “Hidden Wells” quilt design. I will definitely explore that area. The Historically Modern Quilts blog had an interesting post on Art Deco thirty years ago. Give it a read, you may get inspired. I recognize a few names…..Nancy Crow, Jane Sassaman…. The above quilt called Warp and Weft was created by Cheryl Brickey and was submitted to QuiltCon’s APQ 9-Patch Challenge. It got juried into QuiltCon East 2017. Maybe I can talk my sister and a few friends into a road trip this year. I find the simplicity of this quilt so striking, yet the challenge was met so completely. Oh how I wish I could think that far out of the box. Perhaps that is my challenge for 2017…..let’s see where that thought takes me. Could be fun. I’ve already got a new quilt perking in my mind. I’ve defined the 3 limits for a new quilt now we’ll see where that takes me.